This is your first stroke of the round. Watch you don't go out of bounds to the right. 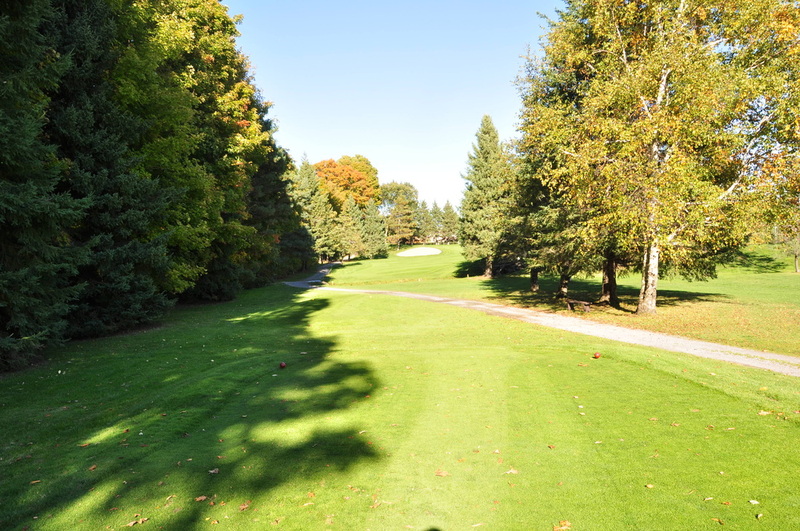 If you can hit it past the old dogleg to the right into the narrow part of the fairway your in perfect position to hit the green on your second shot. We have already talked about this one. If I make a bogey I am very happy. Par? Yes I have made one, I think! Birdie? Are you kidding? 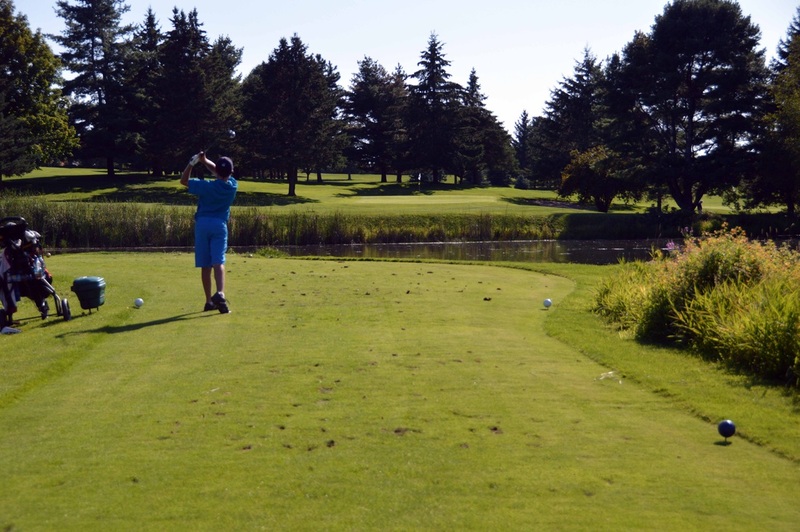 How many "hole in one's" have you made in your golfing career? I bet its more than birdie's on this hole. I don't seem to have much trouble with the out of bounds on the left and I am not intimidated by the water. I do however bounce it off the cart path and frequently take a short approach shot to the green. 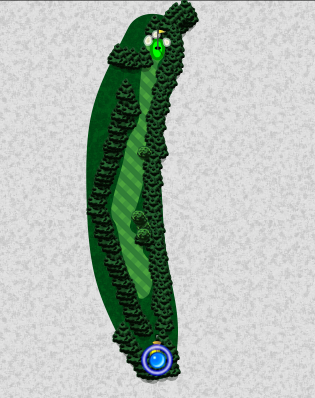 It's a long par three. 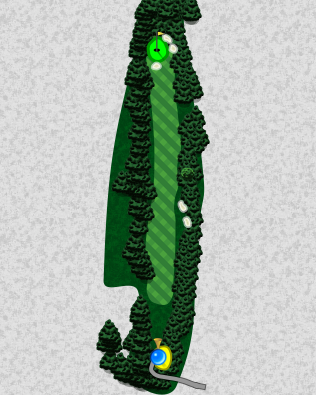 Anyone know what the "blue dot" is doing on the tee diagram? We have incorporated our diagrams in a great free app. Now we at the very back of the course. We are looking uphill and into the prevailing wind. When it's blowing hard I will settle for a bogey. Miss hit and your in the traps on the right. A difficult shot to hit the well bunker-ed green from there. You don't see the right fairway bunkers... see the bigger tree behind them on the diagram.... now look for the tree in the picture. They are down there just over the hill. 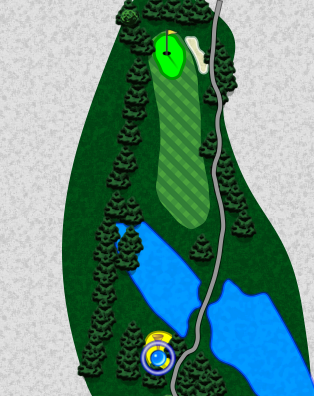 Great down hill and with a prevailing wind go for that birdie. 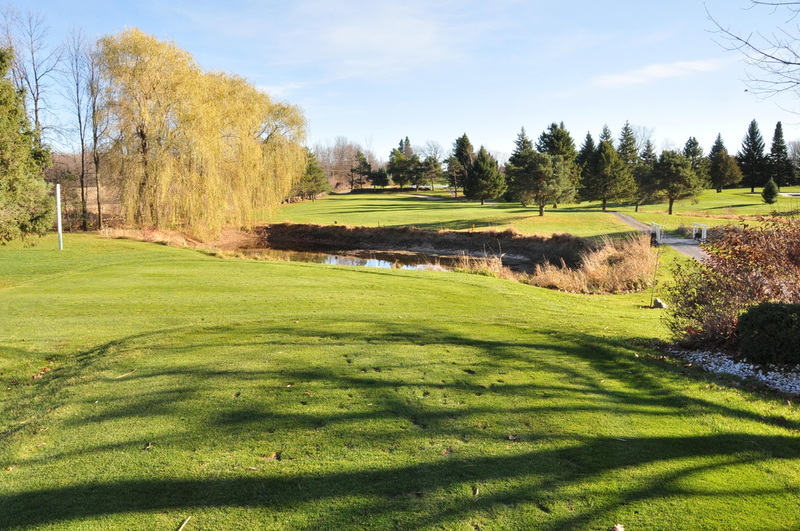 It may be long in yardage but it's the easiest hole on the course with favorable conditions. Pull out the stops, you can't even get in trouble with a duck hook. The "blue dot" won't move very far though! 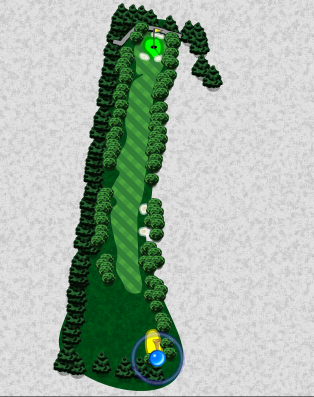 If you keep it in the fairway you have a good chance of making par on this one. There are some undulations and a natural catch basin on the right. 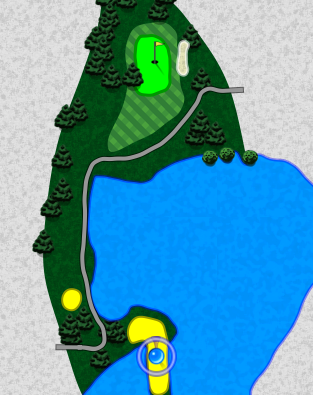 They have conveniently placed the bunkers so your ball doesn't end up on the 7th fairway. Very nice of them wouldn't you say? I try and keep it going up the left but keep it out of the trees that protect a stone fence. You very rarely get a good bounce. 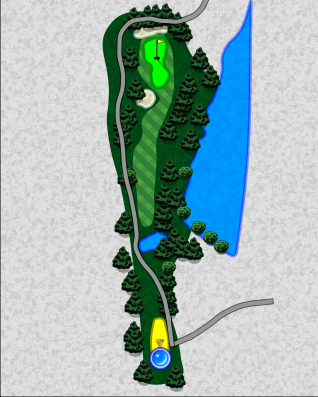 If your a strong hitter (not me) you can hit it well over the knoll around the dogleg down the hill and hit the bell. If you do, concentrate because it's hard to finish well. 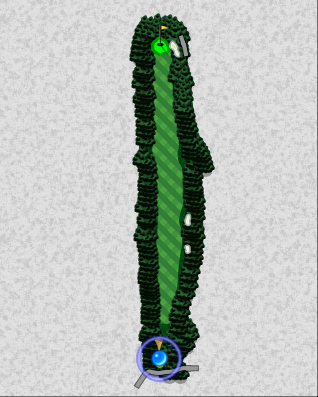 The green is well protected and difficult to hit and stick. 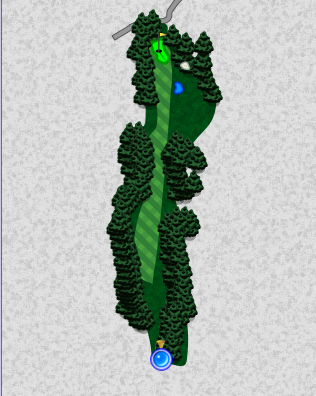 This is the shortest par 3 and for once in range for me. I must confess I try for birdies. It's a two tiered green and hole placement can be tricky. If I am going to miss the green I prefer to miss it left. I am good at a bump and run from anywhere there - unless I am behind a tree. I played with a fellow one round who mentioned he was 9 out of 10. I figured that's not the end of the world until he told me that was 9 in the water. Home stretch but a long one. Makeable though. If you cant make it over the hile and are blind to the little pond make sure you aim well. 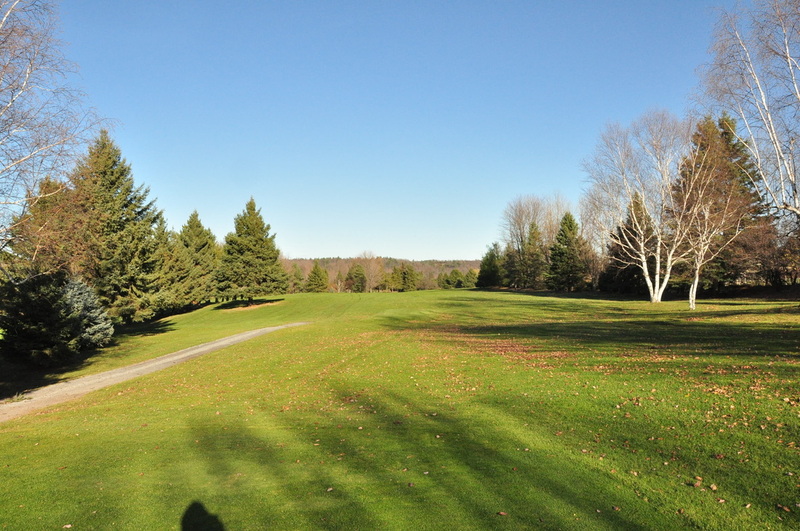 Don't be in a hurry to enjoy the new club house by hitting it over the green. Just a minute - is a good score better than a cool one? Depends I guess.